The retail industry has always experienced disruption in one way or the other, but now the industry is facing a permanent disruption in the way consumers are shopping. 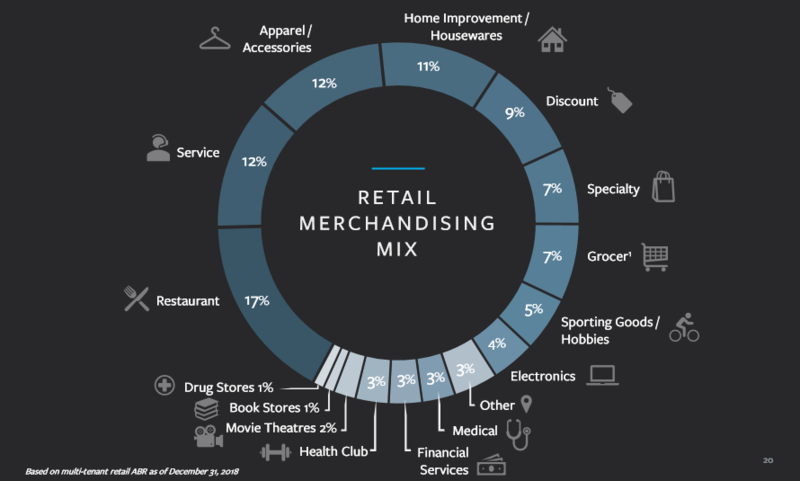 The change in consumer preferences and the evolution of eCommerce has impacted the retail industry and has stimulated major retail REITs to rethink their strategies for survival. As the competition from e-Commerce increases, only the agile and skillful retail REITs are in a position to survive in a market where store closures and retail bankruptcies are routine. It has now become critical for all the retail REITs to adapt to the changing environment and thrive in an on-demand world where online ordering is linked to in-store pick-ups and returns. With a focus on thriving in the new retail environment, major retail REITs are refurbishing their portfolios by improving the quality of assets and selling away low-quality assets. They are also positioning their assets as mixed-use properties and community gathering centers. Retail Properties of America, Inc. (RPAI) acquires and redevelops properties to position them as mixed-use assets. RPAI’s strategy is to create long-term shareholder value by acquiring and redeveloping Class A assets. Over the past five years, the REIT has been able to keep pace with consumer preferences and adapt to the rapid changes in the retail sector. RPAI has always adopted a “real estate first” approach for improving the quality of its assets and for attracting a diverse mix of tenants. Since 2013, RPAI has reduced the number of shopping centers in its portfolio by half with a view to own fewer but higher-quality assets. Instead of establishing its presence throughout the USA, RPAI preferred to focus on the Seattle-Texas corridor in the West Coast and the New York-Atlanta corridor on the East Coast. 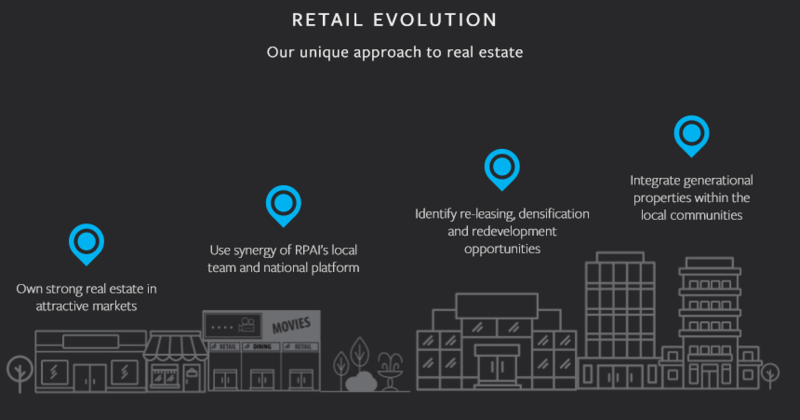 Besides localizing its business, RPAI also focused on achieving retail densification: the practice of incorporating food, fitness, healthcare and entertainment facilities within the existing shopping center environment. The key idea behind this transformation was to provide a high-quality consumer experience. 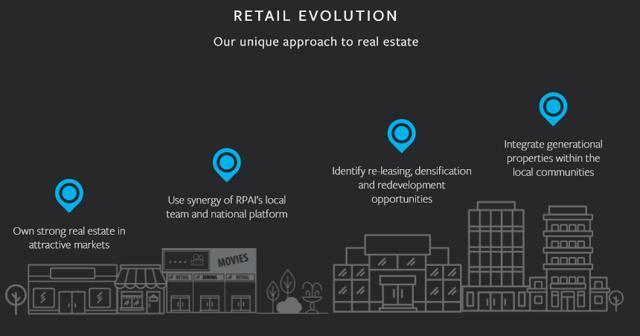 As of now, RPAI is acutely focused on developing its retail properties into mixed-use locations where consumers can live, work and play. Besides looking out for growth opportunities within its existing portfolio, RPAI has identified potential development, redevelopment, expansion and pad development opportunities for adding standalone buildings and developing additional commercial gross leasable area (GLA) at existing properties. While pursuing its development projects, RPAI is poised to benefit from the country’s macroeconomic environment and demographics. Within the US, commercial real-estate fundamentals are strong due to a strong economy, 90 consecutive months of job growth, and 18 year low unemployment. In addition to a robust economy, 2 demographic trends are benefitting RPAI. First, the affluent and the rapidly retiring baby boomer generation prefers to retire to high-end mixed-use centers. Second, the millennial generation’s collective spending power is growing and it will be reaching 1.4 trillion by 2020. These demographic trends will be the primary drivers that will usher the growth of “live-work-play” real estate environments in the perceivable future. As of now, RPAI’s portfolio is comprised of 105 assets and approximately 80% of these assets are neighborhood community and lifestyle mixed-use centers. RPAI has over 425,000 square feet of GLA and almost 1,200 multi-family rental units contained in its announced redevelopments and expansions. 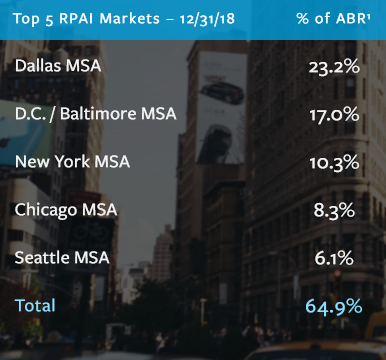 All of these projects are located within the REIT’s top five MSA (metropolitan statistical areas) markets, namely Dallas, Washington D.C. – Baltimore, New York, Chicago, and Seattle. These markets represent approximately 65% of the REIT’s average retail annualized base rent (ABR). While executing its business strategy, RPAI has exited multi-tenant retail operations in Alabama, Colorado, Louisiana, New Mexico, and Ohio. The company believes that a geographically focused portfolio allows it to optimize its operating platform and enhance its operating performance. The markets identified by RPAI possess five main characteristics, namely strong barriers to entry, a strong demographic profile, well-diversified local economy, conducive regulatory environment, and operational efficiency. Through its lifestyle centers, RPAI aims to target and reach a broader audience and not just retail shoppers. Along with transforming its portfolio, RPAI has also strived to improve its tenant mix by curating the right types of tenants. In 2013, the REIT’s top 20 retailers made up 38 percent of its asset portfolio. As of today, the top 20 retailers make up 29 percent of the portfolio and no single tenant is greater than 3 percent of the company’s annual base rent. The company is also parting ways with commodity-based retailers that do not have an online presence. on Instead, RPAI has opted to lease spaces to omni-channel retailers that have both physical and digital presence. Additionally, RPAI prefers to have tenants with differentiated assortments and a capability to deliver a compelling customer experience. Recently, RPAI launched RPAI 2.0, a new strategic initiative that has helped it to reposition its portfolio and adapt to the megatrends affecting the retail industry. 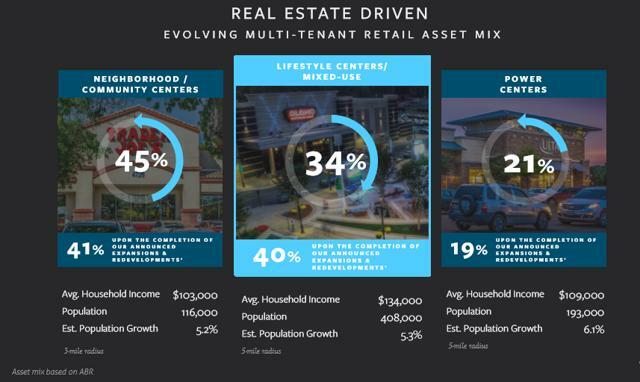 The REIT is uniquely positioned to take advantage of the changes in the retail landscape and numerous densification opportunities within its predominantly mixed use and community center portfolio. The densification opportunities within RPAI’s portfolio will pave way for long-term growth as the opportunities will help the REIT achieve accelerated expansion and redevelopment pace over the next few years. Until now, RPAI’s business strategy has paid off as its acquisition activities and its leasing volumes are in line with its guidance. RPAI is right on track with regard to its acquisition and disposition strategy. In 2018, RPAI disposed of 9 assets from its portfolio which represented 1,831,000 square feet of GLA. In the fourth quarter, RPAI exited the state of Connecticut with the disposition of Orange Plaza for $8.5 million. In all of 2018, RPAI disposed of assets worth $201 million and it acquired assets worth $100 million. The acquired properties include the $25 million worth One Loudoun Uptown in Loudoun County, Virginia. The property comprises of approximately 58 acres and is currently entitled for 2.3 million square feet of commercial GLA. In Loudoun County, RPAI is extremely focused on building a dynamic community anchor that offers an ultimate live, work, play experience in rapidly growing market. The acquisition of One Loudoun Uptown was closed in the fourth quarter and the property is located adjacent to One Loudoun Downtown, a property that is already owned by RPAI. The two properties are located in a region that has a high population density of 187,273 within a 5-mile radius. Besides integrating these 2 properties, RPAI will also focus on the expansion of pads G & H of One Loudoun Downtown. The expansion includes the construction of 378 residential units and up to 80,000 square feet of commercial space. RPAI will be executing the expansion project along with Cutler, its multi-family partner. One Loudon is an extraordinary mixed-use community that is located in the heart of D.C.-Baltimore MSA. On further development, the property will bring a diverse collection of shops, restaurants, corporate offices, homes and entertainment options to the consumers. Most of RPAI’s expansion and redevelopment projects are in the D.C.- Baltimore area and the REIT is uniquely positioned to take advantage of continued infrastructure growth and migration to this region. Due to its balance sheet and sound liquidity position, RPAI does not need to depend on external sources of capital to fund its development projects. In the fourth quarter, RPAI completed the redevelopment of Reisterstown’s Road Plaza located in Baltimore MSA. The redevelopment included reconfiguration of the existing space and the renovation of façade. The property has now been brought back into RPAI’s operating portfolio and it is 100% leased. Just like RPAI’s other assets, the Reisterstown’s Road Plaza is located in an area with high population density. The property houses major tenants like Home Depot, Marshalls, Burlington Coat Factory, Giant Foods and Shoppers World. The redevelopment project was completed on-time and on-budget and RPAI expects that it will generate a return of 10.5% to 11%. In fourth quarter, RPAI has also started the development of Plaza del Lago, a multi-family rental unit in Chicago that was bought by the REIT at the beginning of 2018. The acquisition was a part of RPAI’s broader strategy to buy properties located in a stronger metro area. The high-quality property is located in the heart of a wealthy neighborhood as the average household income within a two-mile radius of the property is $213,000. As a part of the redevelopment, the interior of the apartments was demolished to expand from 15 to 18 units. 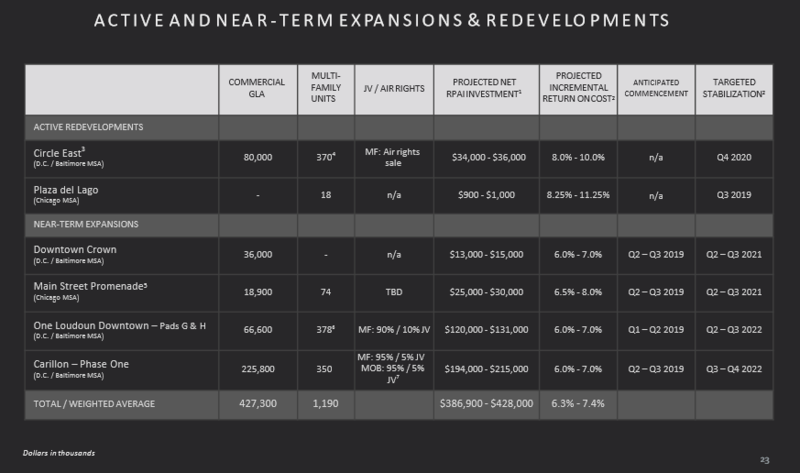 The estimated project commercial GLA for the Plaza del Lago is 20,600 square feet and the property is expected to create value by delivering multi-family returns at about 8% to 11%. Further, RPAI continues to progress with the redevelopment of Circle East property that is located in Baltimore MSA. The asset will be redeveloped as a mixed-used lifestyle property that will include double-sided street level retail with about 370 third party owned multi-family rental units. The development of the street-level retail continues to be on track and the project will be completed by early 2020. 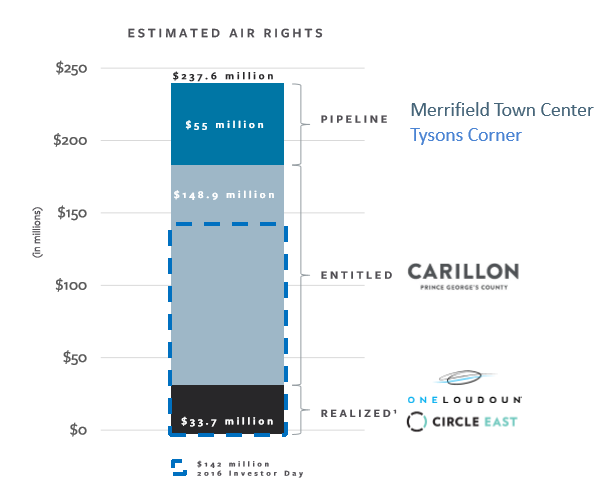 Carillon, a mixed-use property located in D.C. – Baltimore MSA, is being redeveloped by REIT to enhance the experience for all types of uses – residential, office, medical, retail, restaurants, and entertainment. RPAI has planned to construct a regional medical center adjacent to the Phase I of Carillon and the project is on track for 2021 opening. The redevelopment of the Carillon is an example of the type of experience that RPAI plans to deliver to the consumer. RPAI continues to focus on achieving long-term stability and revenue growth by increasing its annual contractual rents and by building an increasingly diverse rent roll. Since the last three quarters, RPAI has achieved sequential increases in both the total number of leases and GLA signed in. For the entire 2018, the REIT has leased 17% of its total portfolio GLA and the leasing is reported to be the highest since its IPO in 2012. In 2018, RPAI has achieved 186 base points of contractual annual rent growth on new leases. The 3.4 million square feet of total leasing in 2018 demonstrated the pricing power of RPAI’s portfolio. In the fourth quarter, RPAI completed about 1.1 million square feet of new and renewal leases. This area represents 5% of the REIT’s GLA. The new leases executed in the fourth quarter represent a significant spread of 34.9%. RPAI ended the fourth quarter with 94.8% lease which has increases by 80 basis points in comparison to the third quarter. In the fourth quarter, small shop percent lease decrease normal 20 points and the decrease was due to the impact of the Mattress Firm bankruptcy. Previously, Mattress Firm had leased 24 locations within RPAI’s portfolio and now the retailer has 17 stores remaining in the portfolio. The lease for one of the locations expired while the lease for the remaining 6 locations was rejected due to bankruptcy proceedings. The beginning of 2019 has seen many small store bankruptcies including that of ShopKo, Gymboree, Beauty Brands, Things Remembered and Charlotte Russe. Even though RPAI remains relatively unaffected by these bankruptcies, the REIT assumes that a small number of tenants on its watchlist will not renew certain locations in 2019. Despite the challenges faced by certain tenants, RPAI is confident about addressing future tenant distressed scenarios due to the strength of its portfolio. From a tenant risk perspective, RPAI has zero exposure to tenant bankruptcies as it has witnessed a rapid resolution of matters from the bankruptcies. The resolution has resulted in unanticipated termination fee income that will contribute to the REIT’s increased 2019 outlook for earnings. For RPAI, 2018 was a pivotal year strategically and operationally as its position was strengthened due to the improved footprint and also due to strong leasing activity. The operating FFO per diluted share was $0.26 for the fourth quarter and $1.03 for the full year 2018. For the fourth quarter, the same-store NOI increased 2.5% over the same period in 2017. The growth was primarily driven by the base rent growth of 160 basis points. The base rent growth was due to contractual rent increase and releasing spreads. The growth in same-store NOI was also caused by a decrease in property operating expenses that largely stemmed from the company’s property-level management expense reduction efforts. For full-year 2018, RPAI’s same-store NOI increased by 2.2% driven primarily by base rent growth of 140 points and a decrease in property operating expenses net recoveries of 90 basis points. 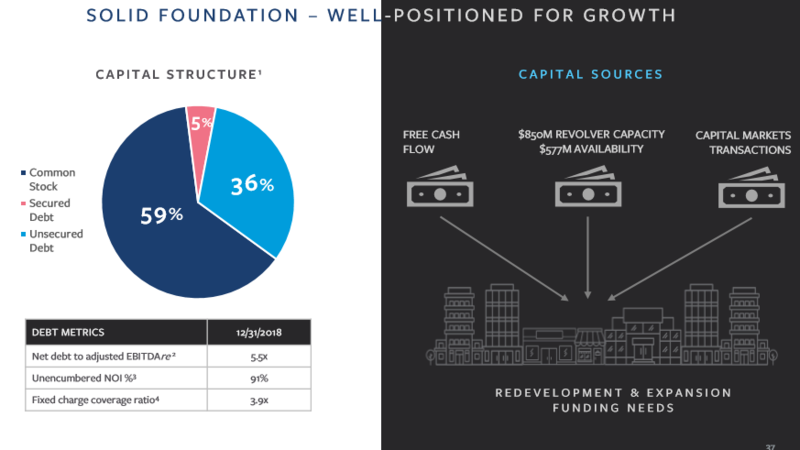 In the fourth quarter, RPAI remained active in its share repurchase program as the REIT repurchased nearly 3.8 million shares at a weighted average price of $11.57 per share for $43.8 million. For the full year 2018, RPAI repurchased more than 6.3 million shares at an average price of $11.80 per share for a total of $75 million. Also during the fourth quarter, RPAI amended its $200 million term loan to reduce its credit spread by 50 basis points. The interest rate savings due to the 50 basis point credit reduction was offset by the impact of two interest rate swaps that the REIT had locked in September 2018. The purpose of the interest rate swaps was to fix the REIT’s interest expense through the November 2023 term loan maturity. At the end of the fourth quarter, RPAI’s weighted average interest rate was reported to be 3.98% which is an increase of 16 basis points from the third quarter. The increment is due to change in interest rate on the term loan and a 28 basis point increase in the cost of the REIT’s LIBOR-based revolver. RPAI’s balance sheet has been bolstered by several factors. Firstly, RPAI’s net debt to adjusted EBITDA stands at 5.5 times. Secondly, availability under its revolver measures $577 million. 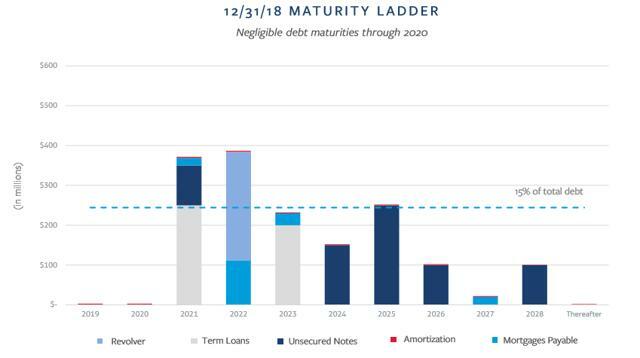 And thirdly, RPAI holds no debt maturities in either 2019 or 2020. RPAI expects its 2019 operating FFO per diluted share to fall in the range of $1.03 to $1.07. The $0.02 increase in full year guidance can be attributed to the REIT’s Q3 and Q4 share repurchase activity. The increase can also be attributed to the increase in expected termination fees that has resulted from the Mattress Firm bankruptcy. RPAI expects its 2019 same-store NOI growth percentage to fall in the range between 1.75% and 2.75%. The expected same-store NOI growth in 2019 will be primarily driven by base rent increase. For achieving its redevelopment and expansion goals, RPAI will be taking advantage of attractive interest rate environment by issuing $200 million to $300 million of unsecured debt. The proceeds from this issuance will be used to reduce borrowings on the REIT’s $850 million revolver which will enhance access to liquidity. Moreover, RPAI expects to maintain leverage levels in the 5.5 times to 6 times area. In 2019, RPAI expects to achieve additional milestones with regard to expansion and redevelopment projects. We haven’t mentioned it quite yet but it’s been deduced from the information provided: RPAI has as high if not higher quality properties than Federal Realty Trust (FRT) and Regency Centers (REG). By some measures, it indeed has the highest quality portfolio. In the State of White America, 1960-2010, Charles White refers to those zip codes with the highest income per capita as SuperZips – zip codes with median household income of $120,000 and where 7 out of 10 adults have college degrees. By those metrics, RPAI has the highest quality portfolio of any of the Shopping Center REITs, with 37% of the portfolio located within Superzips. On a valuation basis, we don’t necessarily think the stock is cheap right now. However, analysts are estimated AFFO growth of 13% in 2019 plus the stock pays a 5%+ dividend yield. That results in a potential return of 18% and upside potential. 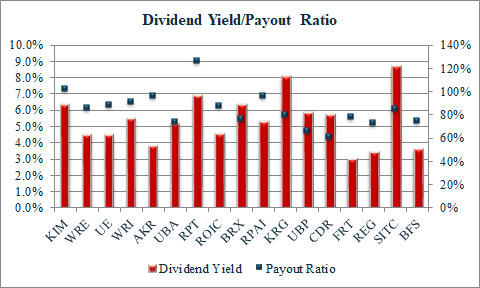 There are some concerns about a high payout ratio and the sustainability of the dividend. However, there are quite a few shopping center REITs with payout ratios above 85%. 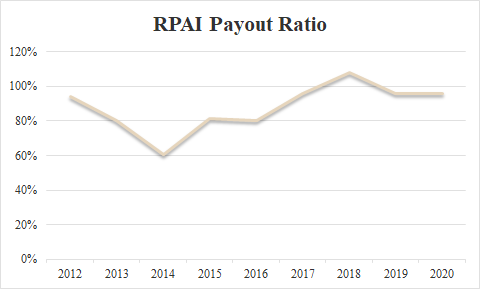 We realize that the payout ratio for RPAI recently reached 108%, but with AFFO growth in 2019 and 2020, we expect it to drop back down to the mid 90% range initially, and continue to decline thereafter. We should see a slight increase in the dividend in 2020 with more aggressive increases in 2021 and beyond. We hold RPAI in our Low Vol REIT portfolio. Take a peek at our Market Dashboard – a Google Sheet with a live feed that will give you a quick take on what’s going on in the markets. Disclosure: I am/we are long RPAI. I wrote this article myself, and it expresses my own opinions. I am not receiving compensation for it (other than from Seeking Alpha). I have no business relationship with any company whose stock is mentioned in this article.